A versatile eating and entertaining area welcomes visitors to a South End condo. 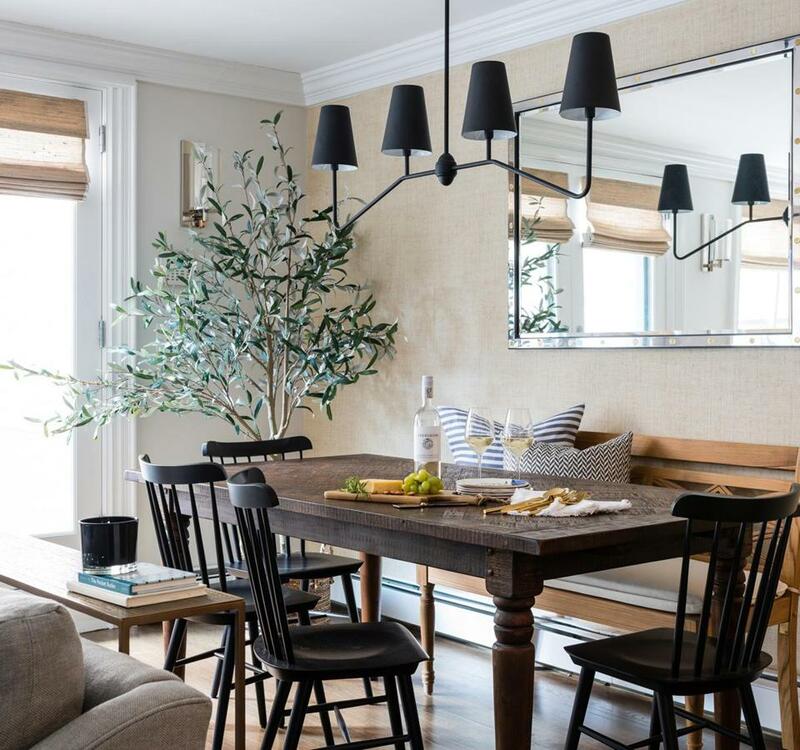 Family-friendly entertaining executed in a timeless, classic style was the goal for the owners of this two-bedroom condo in the South End. Milton-based designer Liz Miller, who has two children of her own, understood perfectly. “It was about function and comfort on a reasonable budget,” she says. “Not forever furniture.” To achieve a cohesive feel in the open layout, Miller devised a neutral, calming color palette. A skinny brass console table behind the sofa separates the family room from the eating alcove and establishes a path to French doors leading to the back patio. With smart furnishing choices, Miller created a contained but by no means cramped place for enjoying meals as a family and with friends. 1 The washable faux grass-cloth wallcovering from Thibaut creates a family-friendly feature wall that differentiates the dining alcove from the rest of the room. 2 A 7-foot-tall faux olive tree from Crate & Barrel adds a shot of green and is maintenance free. “Between the baseboard heat and indirect sunlight, this was the best bet,” Miller says. 3 A linear pendant light in oil-rubbed bronze from Rejuvenation is a strong focal point. “It adds weight to this side of room,” says Miller. 4 The polished steel frame and contrasting brass screw heads of the Restoration Hardware mirror lend a sleek shine (as do the Aerin polished nickel sconces that flank the doors). “The mirror helps define and extend the eating area,” Miller says. 7 Simple Shaker-style wooden dining chairs from Design Within Reach have a compact footprint and are comfortable and easy to clean. “Black helps ground that side of the room,” Miller says.